Quantitative cardiovascular magnetic resonance (CMR) imaging assumes spatially uniform excitation of spins. Heterogeneities in the radiofrequency (B1) field due to effects such as coil loading, conductivity, and dielectric resonance violate this assumption and may result in apparent changes in tissue properties. Previous CMR B1 mapping approaches have relied heavily on custom pulse sequences  and have not included the lungs. To develop a robust B1 field mapping approach that is applicable to the heart and lungs. The double angle method for B1 field mapping  utilizes two images acquired with different flip angles: θ1 and commonly θ2 = 2θ1. Signal intensities from the two images are compared to solve for the true achieved θ1. We used a single shot fast spin echo (HASTE) pulse sequence with excitation flip angles of 60° and 120° for the double angle experiment (refocusing pulses not modified). This rapid acquisition alleviates the need for breath-holding as a means of eliminating respiratory motion in the chest. 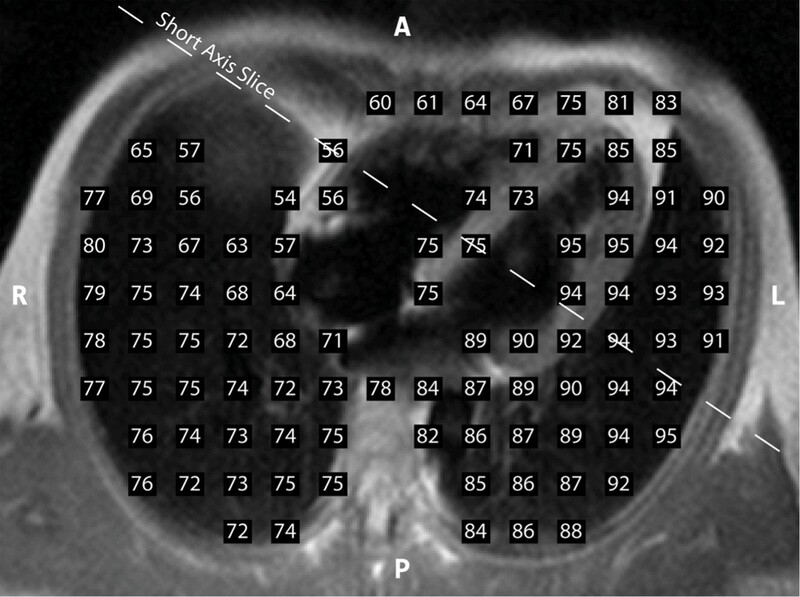 Representative heart coverage was achieved using short axis and four chamber view slice prescriptions. Images can be acquired during a single breath-hold or during free breathing. For free breathing, each image acquisitions was repeated 10 times and the position of the diaphragm and heart was used to select images of similar respiratory phase. All data was acquired on a Siemens Sonata 1.5 T MRI scanner. Typical HASTE scan parameters are: body coil reception, cardiac gating (diastolic imaging), black blood preparation, 360 × 250 mm FOV, 8–12 mm slice thickness, 192 × 70 matrix, 12–22 ms TE, 2.75 ms inter-echo spacing, ~4–5 seconds TR, and 10 repetitions (if free breathing). Each slice was acquired in ~10 seconds (breath-hold) or ~80 seconds (free breathing). Heart and lung tissue were manually segmented and averaged within regions of interest (~3.5 cm2). In Figure 1, a four chamber view shows a significantly varying B1 field across both lungs and the heart. Results are expressed as actual flip angles for prescribed 90° RF pulses. 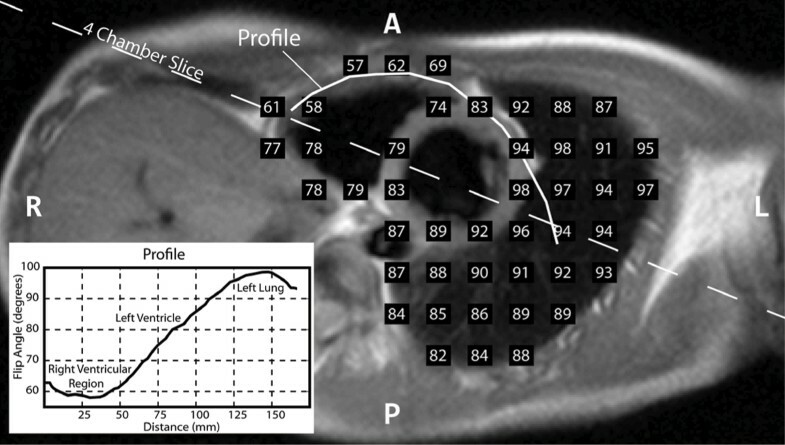 For this volunteer, flip angles in the left lung closely matched the prescribed flip angles, while the right lung flip angles were 10°–20° lower. In the heart, the flip angle ranged from > 90° in the free wall to ~75° in the septum to as low as ~60° in the right ventricle and nearby chest. There are no large variations in the longitudinal direction. Parallel short axis slices (e.g. Fig. 2) confirm these findings. The B1 field varies smoothly within the heart and into the lungs (Fig. 2 – inset). Similar trends were observed in other volunteers. The HASTE approach was validated by comparison to the conventional GRE double angle method in phantom experiments (not shown). Four chamber view of the heart. Short axis view of the heart. Inset: profile through heart and lung. HASTE imaging can be used with the double angle method to map the B1 field in the heart and lungs. Images can be acquired in a short breath-hold or during free breathing. Even at 1.5 T, the calculated RF flip angles deviate up to 40° from a nominal 90°. Comparably large variations in the B1 field were previously observed in the human pelvis at 1.5 T . At 3 T, cardiac B1 maps were found to have larger variations with different spatial patterns . We have validated the HASTE approach for B1 field mapping at 4.7 T in the brain. SAR limitations, which normally preclude fast spin echo imaging at high fields, were overcome using low refocusing flip angles .